PODCAST 111 BRINGS THE PAX THUNDER!! The Mega64 Podcast Episode 111 that we recorded live on Sunday (Which a ton of you came to see, thank you!) is now up to view here and on iTunes and whatnot. We announced a lot of stuff for our upcoming appearance at PAX in Seattle on September 4-6! Let's review it now, shall we? We will be at Booth 3016 for the whole show! The entire crew will be there saying hello, showing new videos, and signing whatever you have (whether you like it or not)! We will have a PAX EXCLUSIVE DVD available at the booth! This rare disc contains a gorgeous array of some of Mega64's best videos of the past year, featuring videos like Oregon Trail, MGS4, Sytefreek & Prycefreek, the HAWX ads, the GDC and E3 videos, Magic City Man, iShotty, Cosplayerz Danze Fantaztic, and many more- Including the feature presentation of a FULL LENGTH new Mega64 film that can't be seen anywhere else! Plus some other secrets as usual! Con-exclusive black Sexy64 ELITE Shirts will be on sale once again! PAX will also be the first opportunity to get the new mystery shirt that Rocco designed, before it goes online! Those who ask for the "Mega64 Ultimate Trivia Challenge" will be quizzed to potentially win one of 10 remaining Con Exclusive 2009 posters! Are you brave enough to take the challenge? 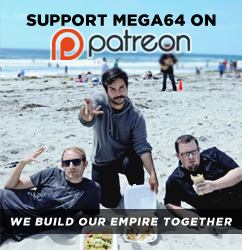 We will be having a Mega64 Panel on Friday, September 4th at 1PM in the Serpent Theater! There is NOTHING ELSE REMOTELY INTERESTING AT ALL happening at that timeslot, so you have no excuse to go, quite frankly!! ...And that's just the tip of the iceberg! Come to PAX and you'll see what a fantastic time everyone has. Hope to see you all there. Am I forgetting something? Oh, right, the podcast. We review Inglourious Basterds, Shadow Complex, and the marvel and wonder that is DIGITAL COBAIN. Audio version is here.